We recently returned from a spending a couple of weeks in Colorado and Wyoming. We had a fabulous trip. We hiked as much as we could and were able to relax in the laid back mountain culture. It was a great trip to do with our 13 month old daughter. Though we did several other activities, hiking was our main objective. Here are a few hikes that we did that were great to do with our babe on our backs. Royal Arch - located right in the heart of Boulder, this Chautauqua hike was great for our group. It is fairly short at 3 miles round-trip, but is pretty steep so it was definitely challenging (especially while carrying the baby). After we headed into Boulder for lunch. St. Mary's Glacier - this hike was short, but sweet. The trail is 1.9 miles round trip, up slightly steep terrain ends in a beautiful glacier and lake. We arrived early, by 7:00am, to beat the crowds, heat and parking back-up. One thing to note is that the starting elevation of this hike is quite high - around 10,000 ft. and a few people in our group who had come in from cities at sea level felt a little off. It might be a good idea to give yourself a couple of days to acclimate before heading here. 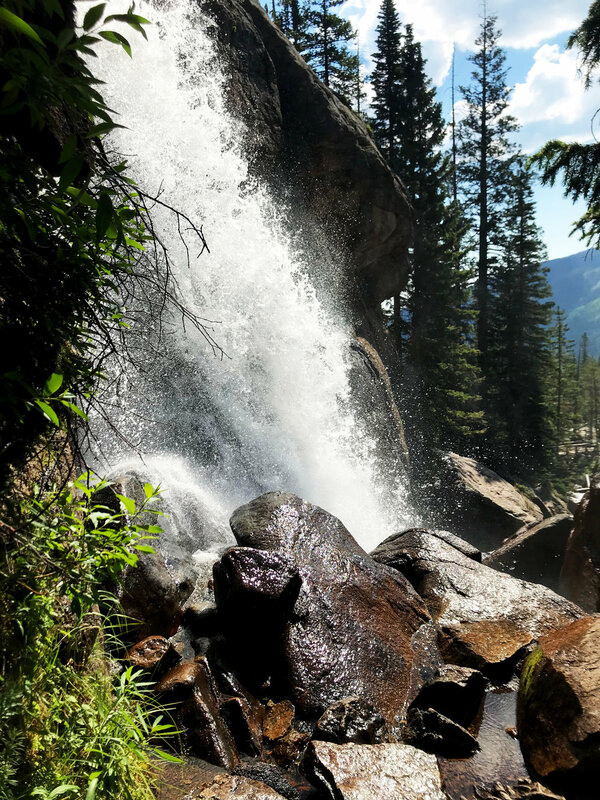 Ouzel Falls - this hike starts at the Wild Basin Trailhead in Rocky Mountain National Park. The park itself is absolutely spectacular. This was a fairly easy / flat 5 mile round-trip hike that takes you by beautiful views and waterfalls. It is also shaded for most of the way, which was nice during the heat of the summer. Again, we arrived super early to make sure we could find parking and to beat the crowds. There is a $25 fee to enter the park - it is well worth it (plus the rangers are super helpful!). Mt. Sanitas - if you are staying in Boulder, this is an easily accessible 3.2 mile hike. A lot of it is in open space so go on the early side to beat the heat. Having quality gear was crucial for hiking with our 20 lb toddler on our backs. We bought a Deuter Hiking Backpack and absolutely love it. It also works as a carrier through the airport etc. The backpack is designed such that most of the wait sat on my hips rather than my shoulders, which made carrying the weight much easier (I was definitely feeling my glutes, though!). I also bought a pair of great hiking boots. You wouldn't necessarily need them for the hikes above, but they do have much better support and traction than sneakers, which I found to be super helpful with the added weight and on the steeper inclines and declines. Another thing I really love about these KEEN boots is that they are wide in the toes, which allows your feet to swell and to still stay comfortable. 2-3 full Hydroflasks - for the first hike, I only brought one water bottle and was regretting it. Baby Klean Kanteen - someone gifted us one of these bottles and it really is great for the baby. A rain jacket! (we actually didn't bring one, but wish we did!) I own this Marmot rain jacket, which I love (and which unfortunately sat in my closet in Miami the whole time). Natural baby sunscreen. We use this one by Alba. Natural bug spray. We use this one by California Baby. Rain / sun cover for the baby backpack. Again, we didn't have this, but wish we did! Snacks for you and for the baby - we packed bananas, sandwiches, string cheese, hard boiled eggs, lara bars, Happy Baby Yogis. When we weren't hiking, we were mostly eating. Movement - on our last day in Denver, my husband went rafting on class 4 rapids. Since this wasn't baby friendly, I headed to Movement, an awesome rock climbing gym, to check it out. We went to the Movement in RINO, it is a beautiful facility and they accommodate boulderers of any skill level. I haven't been rock climbing in years and I had fun / was challenged and didn't bug the pros too much. One of the best things is that they offer child care for $5 an hour while you climb. Grace absolutely loved their center, she didn't want to leave! The Mama 'Hood The Mama Hood offers baby and me and family yoga classes. Denver Central Market - a food market located in the RINO district. The crab avocado toast from Tammens is insane. Denver Milk Market- a food hall with a hip vibe and so many options that there is most certainly something for everyone. The Preservery located in the Backyard on Blake complex, this was by far the best meal I had in Denver. I ordered the Red Trout with Sage Butter, which was fresh and delicious (the baby loved it too!). They also support local farmers and musicians and use a Values and Integrity system instead of tips. Blue Sparrow Coffee - also located in Backyard on Blake, this is a beautifully designed oasis with delicious coffee.